﻿ Gary Ewan Park - Does your development rig support SLAT? Have you checked to make sure that your development rig supports SLAT? Do you even know what SLAT is? I didn’t until today, and it looks like I am going to have to upgrade at least one of my machines. ...form of hardware virtualization that is included in newer version of Intel and AMD Processors, such as Intel’s Core i3, i5 and i7 processors and AMD;s Barcelona processors. For more information on exactly what this means, take a look at this blog post from Tal Sarid. The reason that this is going to be a big deal for me, and why I am going to have to buy some new hardware is that the Windows Phone 8 emulator uses Hyper-V, and as a result, I am going to need hardware that supports SLAT if I want to run that emulator. For more information on this, take a look at this wpcentral blog post. How can I check whether my hardware supports SLAT? Thanks for Mark Russinovich, there is a Sysinternals tool called Coreinfo, which will tell you whether your current hardware can support SLAT. See Ryan Lowdermilk’s blog post here for the exact steps that you need to follow. NOTE: The important thing that you need to look for (for Intel chips) is the asterisk next to EPT. 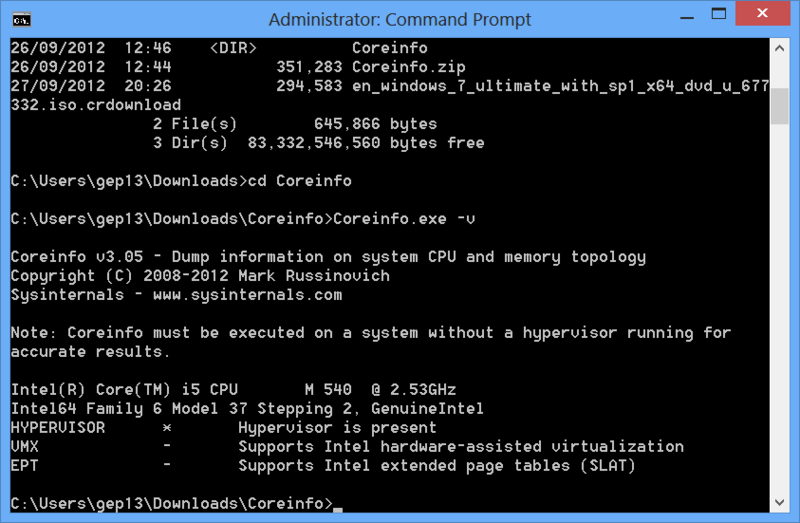 "Coreinfo must be executed on a system without a hypervisor running for accurate results."